An angular, asymmetric roof tops this house designed by Mole Architects for a site overlooking an estuary in Suffolk, England. Cambridge-based Mole Architects designed the two-storey Marsh Hill house for a couple, on a site overlooking the estuary of the River Alde. A dilapidated old property had to be demolished to make way for the new house. Planning regulations dictated that the new building must not exceed the height of its predecessor, and that it must avoid compromising views from a nearby property. 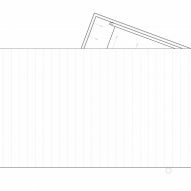 As a result, the architects created a building with a roof that is higher on one side than another, allowing room to squeeze in an upper storey at the eastern end of the plan. 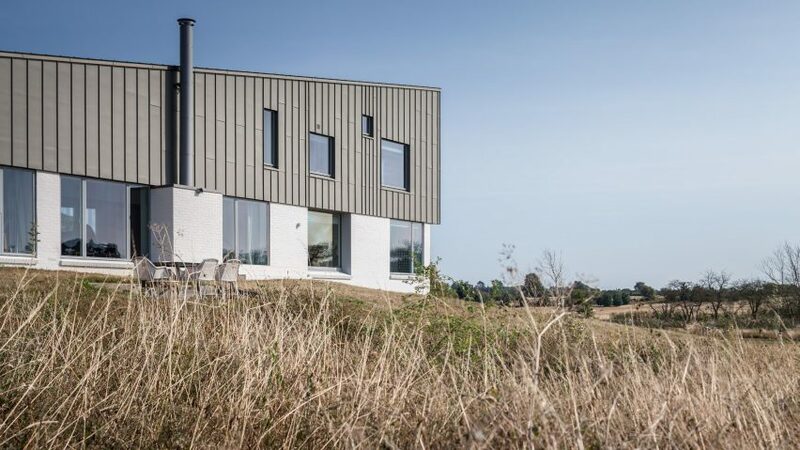 "Located in an area of outstanding beauty, the house hovers over the landscape like a seagull's wing," said the architects. Flooding in 2013 caused by extremely high tides also prompted the architects to consider the need for flood defences, resulting in a house that is raised up above its sloping site. 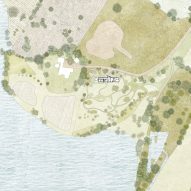 The building's form and materials respond to the conditions imposed by the planners and the landscape. A timber frame is clad in white-painted brick, which wraps around all four sides and extends across an angled entrance that protrudes from the north facade. The south-facing elevation opens up towards views of the wetlands, and the weathered-zinc roof wraps down over this wall. "The white-painted brick and zinc presents a limited and subtle palette, a reflection of the silver water beyond," said the architects. 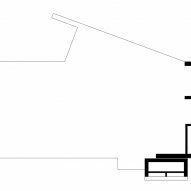 The entrance hallway opens onto a tall living room that displays the angle of the roof. The split-level space connects with a kitchen and dining area at one end, which is situated behind a wall made from painted masonry blocks that offer continuity with the external material palette. Large windows line the living spaces on this level, offering panoramic views of the landscape. A pivoting door in the lounge and sliding window in the dining area can be opened to enhance the connection between the interior and exterior. 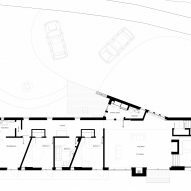 The hallway connects the living space with two bedrooms and bathrooms at the west end of the house, while a staircase leads up towards a study and master suite positioned beneath the raised section of the roof to the east. 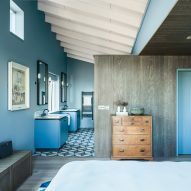 The house features a muted palette dominated by shades of white and blue, with recycled-clay tiles providing a warm, textured floor surface that extends throughout the main living areas and onto the outdoor spaces. The floor in the kitchen and dining space is a bespoke terrazzo containing pieces of Norfolk flint and slate. 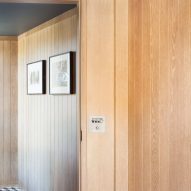 Patterned tiles and stained-oak joinery introduce alternative surface detail to smaller rooms including the master bedroom. 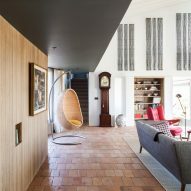 Mole Architects was founded by architect Meredith Bowles in 1996 and has built a reputation for modern designs that employ traditional materials and techniques to ensure they complement their local context. 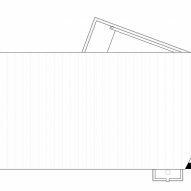 The firm recently received the 2017 Stephen Lawrence Prize from the RIBA for a house comprising a pair of blackened-timber volumes that resemble the upturned hull of a boat. Other previous projects include a cedar-clad house in Suffolk based on classical vicar's residences, and an extension to a protected farmhouse featuring a barrel-vaulted roof that references agricultural buildings.